Kadhambam was the subject of a lot of blogs about 2 years ago. In its own way, it was a novelty in the conservative world of whisky raising interest and suspicion. Why? Because Amrut has taken a "Regular single malt" and then raised it successively in rum, sherry and brandy casks. Was it too much? Will the whisky loose its focus? Those were the kind of questions people were asking. There is only one way to answer those, to taste it. So I will review a dram from a bottle 60% full that has been opened for around a year and as not been attended for more than 6 months. This is bottled at 50% ABV. First I get orange's highnote, followed by low sherry notes but both leave rapidly and I now have the typical spices of Amrut with a big mint working as the core of this whisky. Vanilla is there as well with its ice cream cone, the regular one, not the sugar cone. Almond then hits you big in a way that makes me think of Frangelico then I realise that is because of the bronw sugar in the background (it is not faint but the mint disguise it). With time, the general impression is one of a spicy coolness. On the palate, the sherry is more present. 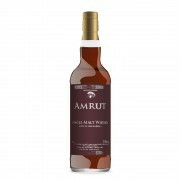 The alcohol bites a bit with usual Amrut spices and then I have some blackcurrant buds mixed with the mint. Usually I don't like when blackcurrant buds is predominent (like in many Bowmore) but here it works well. I don't remember that note from the freshly opened bottle. Finally, I have brown sugar in a way that reminds me of Nikka Coffey malt. The blackcurrant buds fade away leaving the mint and brown sugar lingering with some spices in the back. This Kadhambam is still good but not even close to what it was. With time, the rum cask had increased its influence and the bramdy cask has almost disappeared. The balance is not as good as it used to be now that some highnotes have left. The high level of alcohol does not carry those highnotes anymore and is therfore too much in the front. So the real conclusion is drink this one in a month or two or gas it. I've found with many Amruts that exposure to air over time tends to dampen the flavour. It's a shame because (especially with special releases) Amruts are often hard to come by and you want to stretch them out as much as possible. Thanks Robert. Personally, this is on the lower end of the Amrut scale for me. Still good though! @Nozinan It is good to know. Usually I find that peaty whiskies and virgin oak finish are flying well (if whiskies can swim in water, they ought to fly with air time exposure). Is it coincidential? I would certainly like to know people opinions. @Alexsweden Thanks for the comment. 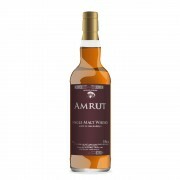 A fresh bottle would have been over the regular Amrut but below the CS peated. There are not many whiskies besting the peated CS!